DIY Afficianados and Water Softeners – When Do You Call In The Pros? The very fact that you’re reading this entry means that you already know a thing or two about the havoc hard water can wreak on your plumbing. From premature breakdowns of your dishwasher and washing machine, to dry and damaged skin and hair. We’ve already talked about how a water softening system can alleviate all of these issues, and you’re ready to climb on board. Only one question remains – Is this a DIY project, or do you need a helpful hand? Before we begin, it’s important to determine exactly why you are ready to invest in a system. Different water sources require units with specific strengths and capabilities. While you are likely already researching the issues at hand (rust, soap scum, metallic or sulphuric water, staining, itchiness, brittle hair, et al) and you may feel comfortable with the unit you have chosen. Excellent. Now, have you tested the ph balance, contacted your water company for source info, and had your ground soil tested? It can get overwhelming fast, and with the amount of time you’ve spent on hold with your water company, you’ve had enough time to read our blog about whether or not you should be installing this yourself. While you enjoy that on-hold music, we’ve assembled a list of five considerations for you before you proceed. If at the end you decide to give us a call, we don’t plan to keep you waiting so long! We Don’t Hire Amateurs. Water Quality is All We Do. No matter the job you’re hiring out, you want only the professionals handling your investments. From dentists to contractors, you hire only the best. You research client ratings, training, and their BBB score. We are prepared to hold up to this scrutiny. Your water is just as important to us as it is to you. Our team has done their homework, and yours. From education in the physical and elemental properties of all qualities of water, to the principles of plumbing, permits, product, and paperwork. Our experts are single minded about water quality, and are anxious to perform their acts of nerdism for you. Can You Trust a Person Who Also Sells Tires and Trampolines? While we have every faith in your home improvement skills and DIY prowess, there are some jobs you need a helping hand. While big box stores will give you an answer to any question, it is very likely not the correct answer, as your salesperson is in no way trained in water quality. The extent of education your average home-repair supply store employee has on water systems is likely having read the back of the box while waiting for you to catch up to them. 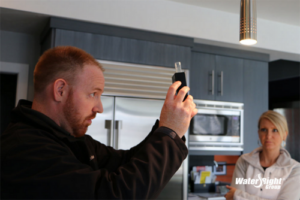 Many online DIY sites are peopled with “tool man” style “pros” who use a lot of trial and error to luck their way into a repair or install, and have very likely damaged their home and system, without realizing it. They’ll find out… in an expensive way. Your home simply doesn’t work without clean, reliable water. If you aren’t 100% confident in your training, you should rely on someone who can tell you straight. Don’t forget that after your install, your system will require routine maintenance, and even if you trusted the kid at the hardware store, it’s unlikely he’ll still be there when it comes time to maintain. All of this could add up to quickly requiring the purchase of a brand new system, and possible plumbing repairs. Our experts don’t just install and leave you high and dry – No pun intended. They will educate you along the way, providing insight into your system, maintenance, and what to look for. Avoid damage, repairs, frustration, and added cost. While the recipe for clean water is as simple as H2O, it’s likely that your glass has several unexpected ingredients. From the harmless to your health but hazardous to your home additions like metals and minerals, to the slightly less benign bacteria, arsenic, and volatile organic compounds (VOCs). Some of these additives leave bad tastes, residues, or odors, but some cannot be detected without proper water testing. Our concern is for your whole family and home’s health, and our dealers put your water to the test for hardness, iron, nitrates, total dissolved solids, and ph levels. Tests are then submitted to one of the country’s most certified lab services, Clean Water Testing. This laboratory is state certified, neutral and independent. When we’re done, you will know everything that is and isn’t in your supply, and we can guide you in the best ways to treat it to ensure the healthiest, most delicious water for your family. Of course installing a softening system isn’t rocket science. It is, however, elemental science. Technical factors like placement of the system, adequacy of your drainage system, and approval of air gap and drain assembly are all taken into consideration, and the selection of the system itself requires a thorough knowledge of current water conditions and regulations. Our dealers are dedicated to providing the best for our clients, and thrive under the pressure of perfection. Most water quality dealers are also certified installers, and some are also master plumbers. This distinction is a grueling, years-long education and apprenticeship. There is no denying the expertise of the team we trust with your family’s water. Not only are they fully licensed, bonded, and insured, they are also experts on the physical specifications of each system, and of their territory’s water regulations and permit requirements. Once the perfect system has been chosen and expertly installed, our dealers will investigate for any issues you may have down the line. They are trained to spot possible glitches before they happen, and will help you avoid dangerous and expensive surprises. 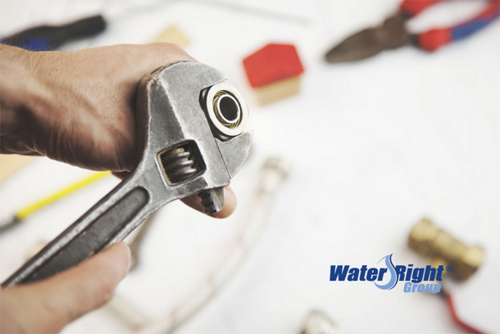 Using a dealer to install ensures that you have a team on hand for maintenance, with experience in your home and with your specific water needs. A relationship with us can help you avoid costly repairs, mistakes, and damages. When it comes to education, enough is never enough. 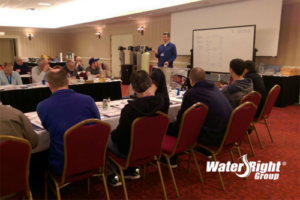 Our water treatment dealers constantly continue their education through Water-Right’s exclusive education program. A collaborative effort, training includes everything from water fundamentals to advanced treatment techniques. Product education, technical support, and customer service programs are all part of the continuing education your dealer undergoes before ever setting foot in your home. We also stay connected to industry experts to stay involved with and abreast of all advances in the field. The most notable of these connections is the Water Quality Association, an international trade organization with its own research foundation, specialists, installers, treatment reps, master water specialists, and product quality assurance program, just to scratch the surface. You wouldn’t trust your neighbor to install your HVAC, or your sister’s boyfriend’s cousin to install plumbing. Your water treatment is delicate and complex, and requires the same level of expertise and care to function properly. Don’t risk it! Schedule a water evaluation today and find out why our clients turn to us for exceptional customer care and expertise! We Have Your Water Care Solutions! Visit our trusted brands and find a dealer to contact a water professional in your area! If you are concerned about your water quality or your risk for contamination, use our Clean Water Testing and get the answers you need!